Little kids resemble their parents, don't they? But little frogs don't resemble adult frogs! The eggs undergo 'metamorphosis' - a lot of changes to become adult frogs. The life cycle of a frog worksheets here include vibrant charts depicting the stages, diagrams to comprehend metamorphosis in frogs, facts to describe each stage of the life cycle and many more frog fun worksheets recommended for Grade 2 and Grade 3. Brainstorm kids to figure out what they know about frogs. 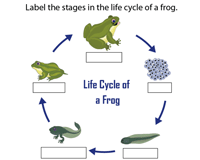 Introduce the stages of a frog's life cycle with this aesthetically designed chart to assist grade 2 kids in picturizing the stages of the life cycle of a frog. 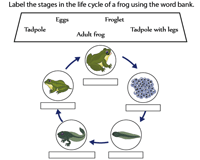 This seven stage division of the life-cycle-of-a-frog chart assists grade 3 kids in comprehending the changes clearly. This chart helps visualize the stages and to grasp and retain the concept instantly. 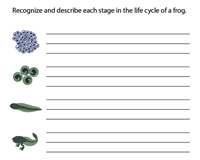 Observe the frog's life cycle diagram featured in this worksheet, identify the stages and use the appropriate words from the word bank to label the five stages in the life cycle of the frog. 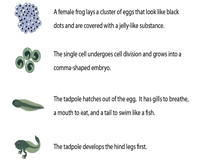 This eye-catchy worksheet illustrates the life cycle of a frog from the egg to an adult. Recognize the stages and label them in sequence. This worksheet serves best as a recapitulating activity. 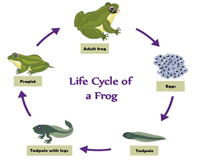 Read the brief description of the life cycle of a frog given in the fact sheet for grade 3. Comprehend the development that occurs in each stage. 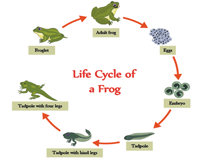 Recognize and describe the stages of the life cycle of a frog. This worksheet serves as a follow-up activity to review and test comprehension of third grade kids. 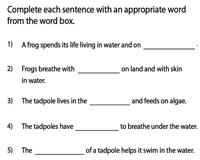 Reinforce the concept with this worksheet featuring interesting facts of the life cycle of a frog. Complete the sentences using apt words from the word bank. 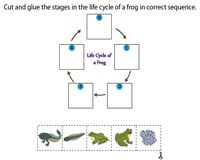 Cut out the picture boxes and glue them in the correct sequence to depict the life cycle of a frog. Reiterate the concept with this cut and paste fun activity PDF. 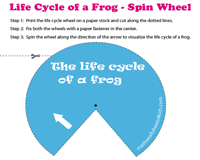 Conjure up an image of the transformation of a frog from an egg to an adult with this life cycle of a frog - spin wheel activity worksheet. Follow the step-by-step instructions to create your own spin wheel.